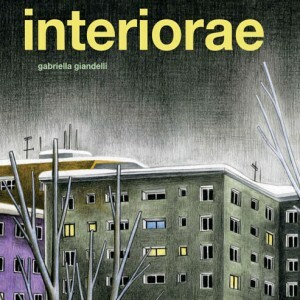 Gabriella Giandelli's Interiorae was orignally published in duotone as part of the sadly defunct Ignatz line of comics co-published by Igort's Coconino Press imprint. This collection of the original issues adds additional colors, including a rich, kaleidiscopic sequence toward the end. 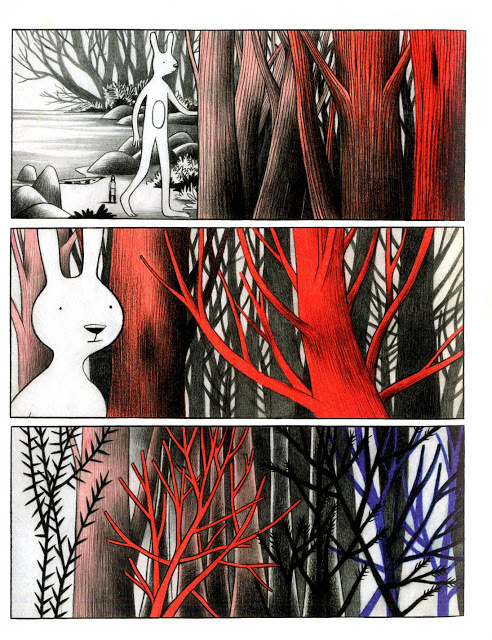 It was one of the quieter, more contemplative comics in the Ignatz line, featuring lush but restrained art and a story that straddled the line between fantasy and quotidian reality. It's a story about the relationships humans have with their dwelling places and the ways in which our collective dreams fuel the life cycle of a building. Interiorae chronicles the decline and fall of one such building, visiting with characters who are either moving on with their lives or stuck in a repeating loop of dysfunctional behavior. 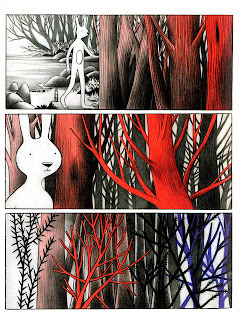 After the reader is slowly introduced to the desperate hopes and dreams of several of the flat's inhabitants, one is then introduced to a magical, invisible white rabbit as he closely observes their lives before he relates these stories to his master: a dark, blobbish creature that lives in the basement, hidden from all. The reader learns that this creature fancies itself crucial in the life cycle of humans, purging them of their toxic and weird dreams. There's no question, however, that the creature needs humans in order to exist. Dreams are very much a commodity for the "master", and he despairs that the most recent batch lacks quality control. 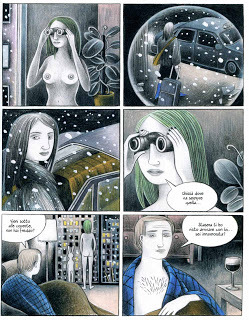 There's a real verisimilitude in the way Giandelli depicts the everyday life of her characters, both young and old. Secrets, lies and mysteries all abound here, but the device of an omniscient observer renders them petty and silly. Many of the characters are profoundly lonely and alienated, and deal with it in different ways: drugs, affairs, screaming arguments, and fantasies. The book's iciest character, an executive who's fooling around with a woman who herself is involved in an affair, loves to spy on others with his telescope, desperate to break free of the boredom in his life. There's a drug addict who's been hiding in the basement for much of his life, afraid of the world at large. There's a ghostly family that died in a plane wreck that inhabits an abandoned apartment, reliving their happiest memories. There are housewives who have affairs simply to have something to do with their day. Indeed, even the "master" is tired of their affairs, their lies, and their boring interests. Giandelli's art is rich and eye-catching, though she offsets that quality with a flat color wash to get at the flatness of everyday routine that she depicts. The flatness of scene matches the flatness of affect of many of the protagonists. The one person who seems to transcend this treadmill is an old woman who is starting to flash back to her childhood. She turns out to be the key character in the book, as her final task in life is to find her way to the other side. She's the only character the "master" finds interesting, because her interests transcend quotidian details. Even as others think she's crazy or confused, the "master" knows that she's a seeker whose presence signals something ominous. The pace of these comics is rather languid, but Giandelli's pages are beautiful enough to hold one's eye, and the tension between fantasy and reality is thick enough to keep the reader guessing. It's that tension that makes the book worth reading, because either element alone would make for a rather routine read. The greater mystery of the fantasy element of the series gives the book's voyeuristic quality some depth. That fantasy element is used sparingly and mostly as a framing device, allowing the book to unfold as a series of character studies. There's a stirring beauty to be found here in the essential, profound sadness of so many of its characters. This is a comic with a number of sharp contrasts that don't fully emerge until after it's been digested. It's the story of the lives of the people in the building: quotidian dramas that seem like life and death to them, but seem rather quiet and muted when compared to this mysterious, ominous mythological narrative. The figures are simply but expressively depicted, but the intensity of Giandelli's hatching and shading on each page adds a sort of neurotic underpinning to everyone's lives. Though one sense all along that these characters are doomed, there's never a sense of judgment or contempt on Giandelli's part toward anyone in the book, even the pettiest or most selfish of characters. 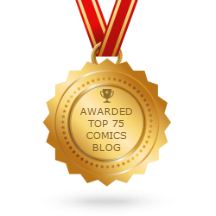 It's a humane and even gentle approach toward dealing with their very human emotions and reactions, even as the end of the book is shockingly harsh and even funny in its abruptness. Those who were ready to move on knew to leave, but those who were trapped were doomed.